Starting this blog has been one of the best decisions I ever made. It was something I had been thinking about for a long time, but I always kept hesitating. Did I read enough books? Did I know enough about blogging? Would anyone even be interested in reading my little opinions? And would I, a serious introvert, even be able to talk to other book bloggers online? Quite a few hesitations… But then, on January 12th, 2016 I finally took the plunge and just started, and this for two main reasons. I just want to talk about books with other bookish people. I love reading, but part of the joy of reading is being able to share this love with other people. And because in real life my options are a little limited, It seemed like the perfect solution to branch out online. And seriously, the bookish community is THE BEST. Everyone has been super kind and welcoming to me. I have loved discovering so many new blogs this year. I have loved reading all your posts. And I have loved coming home to your comments every night and obsessing over all our favorite books together. So… since this book blog has given me so much, I figured this would be the perfect time to give something back. And that’s why I am organising my FIRST EVER GIVEAWAY! The giveaway will run for one week – the winner will be contacted on 20 January 2017. What are some of your favorite book bloggers I should check out? Ahh, congrats on a year of blogging Lindsey ?? That’s so awesome!!! You and your blog are both so, so wonderful and I’m so grateful we were able to meet ♥ Here’s to many more years to come!! Thank you for the giveaway! I have no idea what book I’d chose if I was lucky enough to win ? As for a new skill I’d love to learn another language or be able to play the guitar! As much as I love music, I don’t have a musical bone in my body unfortunately haha. Oh, I knew about Paper Fury (and yes, she's amazing! ), but I didn't know Tales of Yesterday yet so I'll have to check out her blog! Thank you so, so much <3 Hope you'll have more amazing blogging years ahead too! Congratulations on your one-year anniversary! Honestly, I thought you had been blogging a lot longer – your site is wonderful! Oh thank you Amy! It’s my first nomiation yay 🙂 Will definitely do this one soon! Thank you for this generous giveaway! 🙂 To answer your questions, it is SO hard to choose a book I’d like to win, I want so many books at the moment haha. I’m dying to read The Raven King because I just finished Blue Lily, Lily Blue and it was SO good. Also, I really want to read Every Heart a Doorway. Oh, The Raven King would be a great choice! I just finished it last year and fell in love with the series. And Every Heart A Doorway is on my TBR as well, I've heard so many great things! I knew about Reg and Fadwa and visit their blog regularly, but not Kat yet so I'll definitely have to check out her blog! Happy blogoversary!! I’m glad I found your blog this year, I had no idea you’d only been doing this a year! And I agree- blogging definitely is nice when there aren’t a lot of people in real life to talk books with. Such a great community. Congrats and good luck in the future w/ your blog! Thank you so much! It’s been a great blogging year and I definitely hope there’ll be many more years like this 🙂 The bookish community is really so amazing! 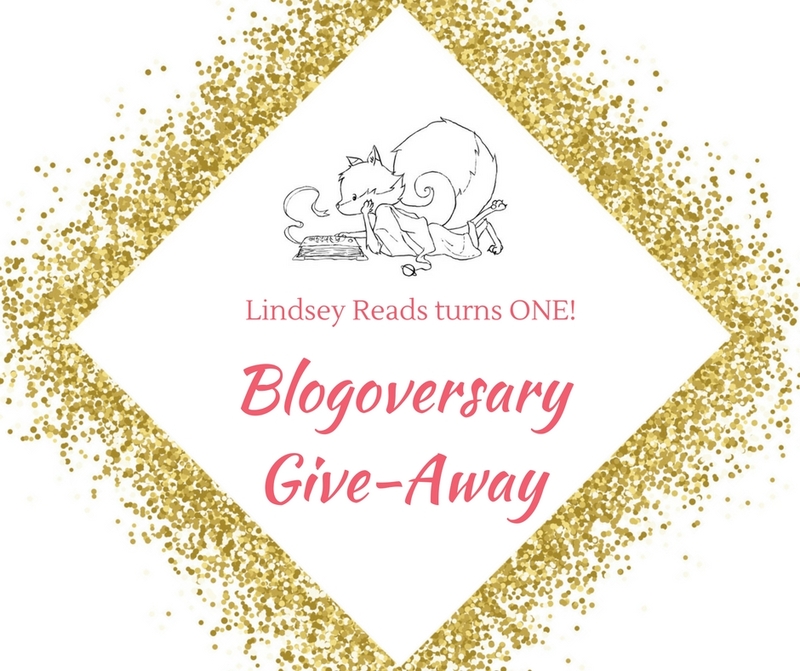 Happy blogversary, Lindsey! Your blog is wonderful and I’ve enjoyed reading you blog these last few months. Thank you so much, Lori! It’s been great discovering you and your blog as well this past year 🙂 Here’s to many more blogging years for the both of us! Happy blogoversary! Hope you have many more to come and enjoy yourself! Hi Melissa, welcome and great timing 😉 Thank you so much! Lindsey, happy, happy 1 year! *throws confetti* SO happy for you and that you are so glad you joined this blogg-y world. We’re glad you’re here! I so agree with what you say about learning ALL THE THINGS! We do have to learn so much about this, but it’s all worth it because generally (with exception to few things), I enjoy everything about this blogging community (including the fact that I can talk ALL THE BOOKS – where I don’t have this IRL – and no one things I’m crazy). Congratulations on reaching one year, Lindsey! I’m glad to hear that you’ve really enjoyed having a blog, and I hope your second year here will be as amazing as (or even more amazing than) your first year. Happy blogiversary, Lindsey! ♥ I started blogging a few months ago, and I couldn’t feel more identified with your words and thoughts! Indeed, this community IS the best, and it’s so nice to get to know new bookish friends all the time 🙂 Hope you continue blogging for many, many years, and become more confident and learn everything you want. And read tons of books, obviously! 1) I honestly don’t know what book I’d pick. My wishlist is really big, and there are many books I’d love to buy! I’d have to do a lot of thinking ^^ 2) I usually read blogs in Spanish, which is my native language, but one of my favorite bookish blogs is NovelKnight – you should check it out! 3) As for the skill I’d love to learn… Well, like I said, I have a blog too, but I’ve only written posts in Spanish. And as I also read some blogs in English, I’d love to learn a little bit more of this language to feel confident enough to write whole posts in English, so many more people get to read my content. CONGRATULATIONS ON 1 YEAR OF BLOGGING!!!! Oh that's so cool that your native language is Spanish! I had a few classes of Spanish, but unfortunately that was 10 years ago and I have lost a lot of it... I can still say a few basic words but not enough to communicate with anyone unfortunately. And your English sounds really good already! Oh yes, NovelKnight is indeed such a nice blog - I just discovered them this month.